Washington D.C. – House Republicans passed legislation on Thursday to repeal the failed Obamacare law. The legislation passed 217 to 213 with NO Democrats joining Republicans to repeal the failed Obamacare law. Initially there were conflicting reports whether the Democrats were chanting this in anticipation of the Republicans losing in 2018 for passing the repeal or if it were Republicans chanting in celebration of finally repealing the failure known as Obamacare. 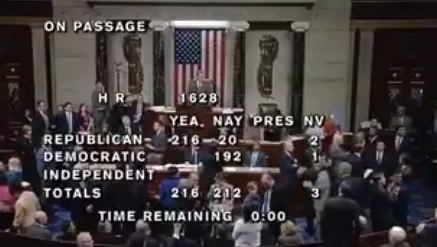 **Update** The Democrats were chanting to Republicans in anticipation of losing in 2018 because of this repeal. 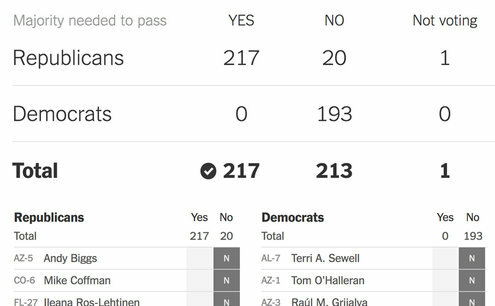 Zero Democrats supported the repeal.